In Brief: The corrupt authorities apparently had no regard for the law, even their own totalitarian law making Pro-Life Human Rights advocacy a crime, much less any regard for a 70-year old man with a heart condition, since law-abiding Cyril was careful to leave his usual Pro-Life signs at home and only displayed signs reading “FREEDOM OF EXPRESSION AND RELIGION. NO CENSORSHIP” and “GOD SAVE OUR CHARTER RIGHTS.” The Ottawa-based Attorney General made the new law specifically with ending Cyril’s Ottawa human-rights witness in mind, and they deliberately arrested Cyril ANYWAY, it seems in order to make an EXAMPLE of him, and to send an INTIMIDATING ANTI-DEMOCRATIC MESSAGE to the Pro-Life community in all of Ontario: “SHUT UP, and don’t even SHOW UP, because we are willing to arrest known Pro-Lifers just for being present,” and Cyril died from heart problems while waiting to be on trial for a crime he did not even commit. This is why it is wholly appropriate to call Cyril Winter a Martyr for Freedom of Speech and Religion, as well as for Human Rights for All Humans, which Cyril had for years regularly and peacefully advocated for, against human-killing abortion, before a totalitarian-oriented government (with Cyril in mind) made HUMAN RIGHTS ADVOCACY a CRIME anywhere within up to a 150m/~500ft radius of a human-killing abortion facility provincewide. The Ontario Attorney General behind the new totalitarian-oriented “no-free-speech-on-behalf-of-Human-Rights-Bubble-Zone" law is the Member of Provincial Parliament (MPP) for Ottawa Centre, the location of the Ottawa Morgentaler (human-killing abortion) Clinic which has repeatedly complained about the peaceful Pro-Life witness outside its doors, and Cyril Winter was the only one who regularly stood on the side of the street that has the door to the clinic, friendly but often carrying photographic proof of the crime against humanity behind the door, showing the corpses of human babies killed by abortion (and other signs like “Choose God’s Love: don’t kill your baby today”). So it is apparent that the Attorney General (encouraged by Ottawa’s Mayor, who passed on to him the human-killing abortion clinic’s complaints largely about Cyril) designed the law specifically with stopping Cyril's witness for Human Rights in Ottawa in mind – and also stopping anyone like him all over the province from advocating for Human Rights in any fashion, anywhere remotely near where humans are being legally killed by abortion. But once the totalitarian law was passed and in force, Cyril, as a good Christian and law-abiding citizen, did not take the bait, and found a way to still protest without breaking even this horrendously anti-democratic law which means they can arrest you for even just staring at a human-killing abortion clinic, which they take as a sign of the “disapproval” of abortion the law forbids within the “Bubble Zone.” Despite the fact the wording and the stated interpretation of this totalitarian law are both so broad that known Pro-Lifers have to “walk on eggshells” in the large Bubble Zone for fear they can be arrested literally just for looking the wrong way, Cyril took great pains to make sure he would not break the new law if he went into the Bubble Zone, even talking with a policeman beforehand to make sure there would not be any problems with his new signs which did not mention abortion, and making sure his back was always to the clinic so he could not be misconstrued as “looking at it disapprovingly.” But the evidence suggests that other authorities were so determined to make an example of Cyril, to intimidate Pro-Lifers into staying home, that when Cyril didn’t take the bait, the Prosecutor instructed the police to arrest and charge Cyril even though his signs upholding freedom of expression and religion in no way broke the new law against Pro-Life Human Rights advocacy (a law that only belongs in a totalitarian State in any case). The corrupt authorities apparently had no regard for the law, even their own totalitarian law making Pro-Life Human Rights advocacy a crime, much less any regard for a 70-year old man with a heart condition, since law-abiding Cyril was careful to leave his usual Pro-Life signs at home and only displayed signs promoting freedom of speech; yet it seems they deliberately arrested Cyril falsely in order to MAKE AN EXAMPLE of him, and to send an INTIMIDATING ANTI-DEMOCRATIC MESSAGE to the Pro-Life community in all of Ontario: “SHUT UP, and don’t even SHOW UP, because we are willing to arrest known Pro-Lifers just for being present,” and Cyril died from heart problems while waiting to be on trial for a crime he did not even commit. Even a 25-year-old in perfect health would have tremendous physical strain on his body from the stress of being falsely arrested with an impending unjust trial (even if he was looking forward to his chance to exonerate himself, as Cy was); as an old man with heart problems, it is not surprising that Cyril’s body failed and he died after authorities with no regard for either the law or for the elderly arrested and charged him, knowing he had not broken any law, apparently for the totalitarian purpose of intimidating the whole Pro-Life community provincewide from exercising NORMAL LEGITIMATE DEMOCRATIC FREEDOMS, which is all Cyril was arrested for. Cyril was consistent in finding the edge of what he could still do as a good Christian, law-abiding citizen – even when the laws were turning evil - and consistent in standing up for the Truth and goodness of human life and human freedom as much as he could without breaking the law, no matter how twisted and totalitarian the law was. Legal human-killing abortion itself literally follows the precedent of totalitarian, human-killing Soviet Russia and Nazi Germany, the first two nations to de-criminalize abortion (in 1920 and 1934, shortly before both committed genocides because where abortion is legal there is no legally recognized Inherent Human Right to Live, which is the foundation of all Human Rights and freedoms. The Nazis were condemned at Nuremberg in 1948 for legal abortion as “a crime against humanity”). But Cyril (born in 1948) went right to the edge of whatever rights he still had to protest this evil which follows totalitarian precedent; and when they made a new totalitarian law to take away his right to do even that, he still found the edge of what he could still do legally, and stood at the place they took his freedom away holding signs advocating now for FREEDOM OF EXPRESSION AND RELIGION. Since it seems the totalitarian law was crafted by Ottawa-based politicians specifically with Cyril’s Ottawa witness in mind, and it seems they were determined to arrest him under this law even if he didn’t break it, and since he died an innocent man facing impending trial for it, it is wholly appropriate to call Cyril Winter a martyr for Freedom of Speech and Religion, as well as for Human Rights for All Humans, which Cyril had regularly peacefully advocated for, against human-killing abortion, before the totalitarian-oriented “Pro-Choice-to-Kill-Humans” government made such Human Rights advocacy a crime, apparently because they could not bear Cyril or anyone having the democratic right to peacefully express a democracy-grounding, human-life-affirming position opposed to their uneducated “Pro-Choice-to-Kill-Humans” position. Cyril lived and died doing what all of us in the Ontario democracy should be doing in the face of Premier Wynne’s Liberal government making Ontario the “world leader” in the current worldwide trend of ‘Pro-Choice-to-Kill-Humans’ ‘Creeping Totalitarianism,’ first by taking away doctors’ freedom of conscience and free speech to object to killing humans by abortion and euthanasia, and now by restricting democratic freedoms of assembly, speech, expression and religion within the large Bubble Zone, all to make sure humans can be killed in Ontario without anyone complaining, JUST LIKE IN EVERY TOTALITARIAN STATE. Cyril did what he could, as long as he could, to make sure our democracy lasts by incessantly protesting the killing of humans by abortion, which is so intrinsically anti-democratic that the only way corrupt authorities can prevent Pro-Lifers from speaking the truth of the EQUAL HUMAN PRECIOUSNESS democracy is built on, is to formally become totalitarian monsters passing totalitarian laws and enforcing them however they like, as they just did, to silence all Pro-Life Human Rights advocacy, at least within their expanding “Bubble Zones.” They even arrested Cy without his even breaking their law, to make an example of him anyway, sending Pro-Lifers the message to just SHUT UP and STAY AWAY. Well, they sent their message - and we got it. And the message we should send back is: WE EDUCATED PRO-LIFE HUMAN RIGHTS ADVOCATES, WHO ARE THE PREMIER DEFENDERS OF HUMAN RIGHTS AND DEMOCRACY WORLDWIDE (since as DEMOCRACY 101 shows, PRO-LIFE=PRO-DEMOCRACY) WILL NOT BE INTIMIDATED (BY UNEDUCATED ‘TOTALITARIAN CREEPS’) INTO GIVING UP OUR PROPER DEMOCRATIC FREEDOMS TO SPEAK AND EXPRESS THE FOUNDATIONAL PRINCIPLES OF HUMAN RIGHTS AND DEMOCRACY WHICH INCLUDE THE EQUAL HUMAN PRECIOUSNESS OF EVERY HUMAN LIFE – IN OR OUT OF THE WOMB – WHICH DEMOCRACY IS HISTORICALLY AND LOGICALLY BUILT ON. Because the government’s own totalitarian actions in support of human-killing abortion have just again proved the logical link that Pro-Life = Pro-Democracy, from now on, to embarrass them for their ignorance of Human Rights history and their overt totalitarianism, all freedom-lovers should keep going to the Bubble Zones around the province’s abortion clinics with signs or T-shirts bearing the SAME messages the totalitarian authorities arrested Cy Winters for: “FREEDOM OF EXPRESSION AND RELIGION. NO CENSORSHIP” and “GOD SAVE OUR CHARTER RIGHTS” - (quoting) Cyril Winter, Martyr for Freedom of Speech and Religion. I suggest they do not enter the Bubble Zones (they now have reason to fear unjust arrest, like Cyril’s), but tell the people around “I’m here to protest the totalitarian Police State conditions the Wynne government has set up, wherein police can arrest peaceful Human Rights advocates and someone carrying this same sign was arrested just for advocating for free speech.” We are a democracy, not a totalitarian State. I wrote DEMOCRACY 101 so uneducated politicians (and the voters who vote for them) can learn the difference. Cyril’s exercise of democratic freedom forced totalitarian-oriented politicians to show their true anti-democratic colours, and we should honour his courage and protect our democracy by spreading the message he was unjustly arrested for: “FREEDOM OF EXPRESSION AND RELIGION. NO CENSORSHIP.” “GOD SAVE OUR CHARTER RIGHTS.” And because PRO-LIFE=PRO-DEMOCRACY, like Cyril, we must never stop our Pro-Life Human Rights advocacy for legally recognized Human Rights for ALL Humans! Cyril’s last sign that he took into the Bubble Zone, after being arrested twice for signs upholding freedom of speech and religion, was “I LOVE JESUS/JESUS LOVES YOU.” They did not arrest him for this, which means they are not bringing back the lions for Christians right away. But how far behind can this be, when they have already passed a law meaning Christians and others can be arrested for speaking Christian values like killing humans is wrong because Human Rights are for all humans anywhere within blocks of where humans are being killed by abortion? 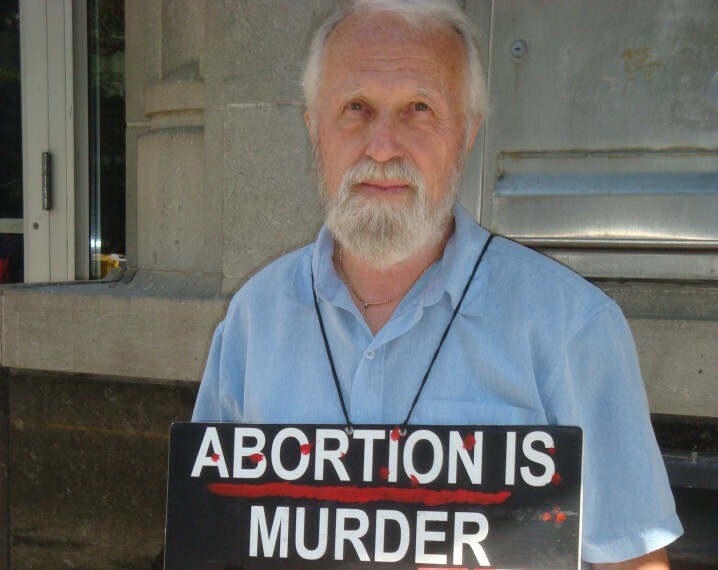 The police, strictly enforcing current Ontario Law, would most certainly have arrested Cyril Winter if he had brought back his old Pro-Life sign advising women to “CHOOSE GOD’S LOVE. DON'T KILL YOUR BABY TODAY.” And in any case the police DID in fact arrest and charge Cyril Feb.7 just as a known Pro-Lifer with a sign reading “FREEDOM OF EXPRESSION AND RELIGION.NO CENSORSHIP” and on Feb.9 with a sign reading “GOD SAVE OUR CHARTER RIGHTS.” The Canadian federal government now requires an “attestation” that you are Pro-abortion before you can get government funding for some programs. These anti-Pro-Life laws and policies (mirrored in other countries like France where Pro-Life websites are illegal) can only lead eventually to the explicit persecution of Christians IF Western citizens do not soon get EDUCATED in the necessary Christian, Pro-Life foundations of our whole free and democratic Western way of life, which are laid out so clearly in DEMOCRACY 101. There is no Democracy as we know it without Human Rights; and there are no Human Rights without Christianity. Most serious Pro-Lifers are Christians, simply because Christians introduced the idea that killing humans is wrong into Western Civilization. BEFORE Christianity, the GOVERNMENT was often the biggest THREAT to human life and freedom; but Christianity taught the West that human life was NOT cheap, to serve a greater State (as was the worldwide norm); but that every human life is PRECIOUS and that the State government is OBLIGATED to protect (and ultimately serve) precious human lives. Then Human Rights were first effectively recognized in law with the 318 AD criminalization of human-killing abortion and infanticide due to Christian influence, only 5 years after the West stopped violently persecuting Christians in 313 AD; this laid the logical FOUNDATION for all Western Human Rights and freedoms which developed since (in Western Christian Civilization). Known Christian Pro-Lifer Cyril Winter's unjust arrest (and death while awaiting unjust trial) just for holding signs upholding freedom of expression and religion (in protest of the government taking away his right to do peaceful Pro-Life Human Rights advocacy which can be done in any healthy democracy), among many other signs indicates a general Western regression to the human-killing Pro-Choice-abortion values AND TOTALITARIAN style of government which were BOTH NORMAL in the West before Christianity. This should be a clarion call to wake up both Christians and non-Christians to the fact that PRO-LIFE=PRO-DEMOCRACY, and that Christian or not, we need to at least restore RESPECT for the Christian, Pro-Life foundations of Western freedom if it is to last. Legal human-killing abortion itself literally follows the precedent of totalitarian, human-killing Soviet Russia and Nazi Germany, the first two nations to de-criminalize abortion (in 1920 and 1934), shortly before both committed genocides because where abortion is legal there is no legally recognized Inherent Human Right to Live, which is the foundation of all Human Rights and freedoms.